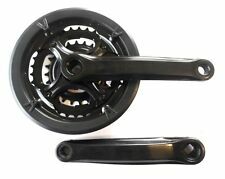 The Shimano Altus M311 Square Taper 175mm 22/32/44 7-8 Speed Triple Chainset with chaingaurd has painted steel rings with painted aluminium crank arms with a resin spider arm cover. 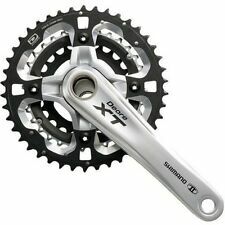 Shimano XTR FC-M970 crankset chainset. Condition is Used. Dispatched with Hermes signed for 2-3 delivery. 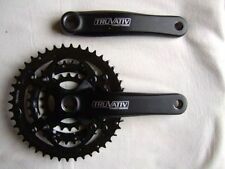 This is top of the range lightweight race crank, used but the big ring will need replacing as shown in photo. Grab a bargain. 8/9spd Triple MTB Crankset FSA Dyna Drive with 113mm*68mm bottom bracket brand new removed from new bike for upgrade Dispatched with Royal Mail 2nd Class. Shimano M950 crankset has the usual rubbing marks on both crank arms. Chain rings are worn but still have plenty of life left in them. Perfect for a retro build. Shimano XTR FC-M960 triple chainset with 170mm cranks and middleburn rings. Plenty of signs of use, but chainrings are actually in good condition with plenty of life left in them. Hence it is now redundant to my needs. The chainrings are 50, 39 and 30 teeth with a 130 mm BCD. The chainrings have never been taken off the spider so although the bolts are in their original condition they could well be difficult to remove. 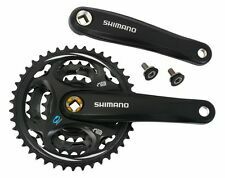 Shimano Deore XT Triple 9 Speed Chainset Fc-m770 175mm & Bottom Bracket. Condition is Used. Dispatched with Royal Mail 1st Class. FSA Afterburner Carbon Triple Chainset . Condition is Used. Dispatched with Royal Mail 2nd Class. Please note no returns on second hand goods which the above is. Shimano Deore M622 Chainset, triple chain rings. 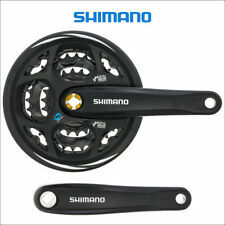 Shimano Deore 10 speed triple chainset. Ring sizes 22-30-40. I WILL NOT SENDInternationally . 22/32/44 chainrings. This is a RaceFace crank set taken from a bike I no longer own. The crank arms are 175 mm long and are in good used condition. Pedal threads are good. Bonrager Powerspline ISIS Drive Triple Chainwheel. I think this needs replacing as its smooth but stiff. Shimano Deore XT M760 175mm Triple chainset (Used) + spare chainrings (New). Shimano Deore XT M760 175mm Triple chainset spare chainrings. Condition is good, used. slight marks to drive and non drive side crank arms but these are slight as pictured. Middle and small chainrings have less than 200 miles use, larger chainring is original, all have plenty of life left in them. Also included are brand new, unopened chainrings for this chainset in 22/32/44. Well looked after chainset, selling as I have gone to 170mm cranks so these are surplus to requirements. Early 90’s Sugino (branded CODA) chainset from a Cannondale M400. They are in good condition but have some foot rub- logo’s have suffered. They need a good clean but have not had much use. They were on the original BB (gone with the frame). Tapers, threads and chainrings all OK. no reserve Sugino CODA Cannondale Crankset Chainset Cranks Retro 170mm Retro Mountain Bukr. Condition is Used. Dispatched with Royal Mail 2nd Class. MPN:FC 6603. used for commuting and on couple cycle rides, i've changed smallest chain ring from orignal 30t to Shimano Deore 28t - to help climb those hills. Bottom Bracket included: Hollowtech II. Great set of XT Cranks in 170 mm, straight, all threads are good, usual marks from heel rub and the odd pedal strike. Square taper. 175mm Crank Length. Shimano Sora Triple Chainset - Vintage, Retro, Eroica, L’Eroica. FC-3303 170mm crank length Triple - 52, 42, 30 Great for any vintage build Condition is Used. Dispatched with Royal Mail 2nd Class. SUNTOUR XCM MOUNTAIN HYBRID BIKE CRANKS 48/36/26T BOTTOM BRACKET. Square taper bottom bracket 68 x 113mm. Triple chainring 48/36/26 tooth. Shimano Altus Triple Chain rings and Cranks. Square taper. Threads and tapers are in good order. 170mm Alloy Crankarms. Chainwheels 48 / 38 /28 Teeth.